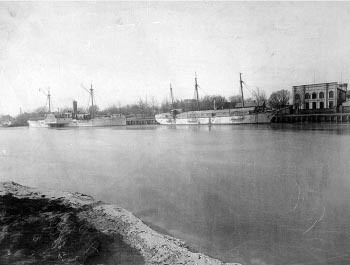 Tientsin (Tianjin; 117.168E 39.140N) was the port of Peiping. It is located 36 miles (58 km) inland on the Hai River and had limited facilities in 1941. Vessels of greater than 14' (4.3) draft could not navigate the Hai and had to anchor just off its mouth. However, the city had become prominent only in the early 20th century and so its buildings and streets were relatively modern. There was an airfield 7 miles (11 km) east of the city outskirts, with four 4000' (1200m) runways, of which only one was an all-weather runway. The city was captured by the Japanese on 29-30 July 1937 following the Marco Polo Bridge Incident. It remained in Japanese hands throughout the Pacific War. The population, swelled by refugees, was approximately a million and a half by the end of the war. The Tientsin Crisis. Japan’s seizure of Manchuria, and the war with China that began in 1937, deepened the rift between Japan and Britain, which had begun with the lapse of their naval alliance and the British move towards the U.S. that accompanied the naval disarmament treaties. By 1939, the Japanese Army, frustrated by its inability to wrap up the war in China, found a convenient scapegoat in the British territorial concessions in China. Many Japanese officers were incensed at the continued presence of armed Caucasian troops in Japanese-occupied China. The British had substantial investments and trade in China, largely based on the Kuomintang fapi, which was in competition with the Japanese-backed puppet currency. Furthermore, the Japanese believed, with some cause, that Kuomintang guerrillas were operating from the British concessions. The British policy of interning captured guerrilla leaders, rather than trying them as criminals, was a particular point of contention. Matters almost came to a head in the spring of 1939 at Tientsin. The British concession had been under pressure since 1935, when the Japanese had blocked the move of the silver reserves here to Shanghai. The concession was vulnerable, being far from the coastline and British sea power and protected by a single battalion of troops. On 9 April 1939, the collaborationist head of the puppet Federal Reserve Bank in Tientsin was murdered, along with a Swiss businessman, by a Chinese terrorist. The British consul in Tientsin invited the Japanese to join an investigation of suspected guerrillas, which produced credible evidence against four men living in the British concession. The men were turned over to the Japanese with an understanding that they would not be tortured and would be returned in five days. Four days later, two of the men confessed to the killings and staged an accurate reconstruction of the crime for British officials. The British police concluded that the two men were guilty of the assassination. However, the men also claimed to have been beaten and forced to drink kerosene by the Japanese, and the British police concluded that they had been subject to water torture. The British consul was inclined to hand the men over to the Japanese. However, Madame Chiang Kai-shek pressured the British ambassador in China to prevent this, while Japanese authorities whipped up the local Japanese press to make calls for a move against the entire concession. The consul was slow to report the evidence against the men to London, and it did not help that the British police could not make up their mind whether to believe the suspects' confessions. Lord Halifax, the British Foreign Minister, would agree only to turn over two of the men who had been found with explosives, but this decision was not communicated to Tokyo until 5 June 1939. By then the local Japanese commander, Homma (the future conqueror of the Philippines), had lost patience, and had demanded a decision by 7 June. Though Homma's note was diplomatically phrased, its imposition of a time limit allowed Homma's more hotheaded chief of staff, Yamashita (the future conqueror of Malaya), to communicate directly with Army ultranationalists in Tokyo, who seized the opportunity to provoke the British and pressure their own government to sign a formal alliance with Germany. On 14 June the Japanese blockaded the British concession in Tientsin, demanding that the concession cease the use of fapi, turn over the silver reserves, and suppress all anti-Japanese activities. A Japanese military spokesman declared that "The arrow is already off the bow and therefore the question cannot be settled by the mere transfer of the four suspect assassins." The Japanese were not expecting a strong British response. Meanwhile British public opinion had been stirred up by lurid reports of strip searches of British women at the Japanese blockade points and by apeals to British racism. The evidence against the suspects had not yet been reported. The British Government was aware that Japan was on the verge of joining the Axis, and the threat of war in Europe meant that there was no chance of mounting a military expedition. Pro-Chinese opinion in the Foreign Office meant that the pleas of the British Ambassador to Tokyo, Sir Rorbert Craigie, to avoid playing into the hands of Japanese extremists were largely ignored. Craigie pointed out that the policy of backing the Kuomintang against Japan as a way to restrain the Japanese might be morally correct, but it would fail to achieve its purpose if it led to a direct Anglo-Japanese confrontation. With no forces to spare for the Far East and no real hope of American or French assistance, the British Government left Craigie essentially on his own. Backing down was unthinkable but a show of force was impossible. Yet Craigie was able to persuade the Japanese to negotiate in Tokyo, where he was able to secure the clandestine aid of moderate Premier Baron Haranuma on 24 June 1939. Craigie resisted pressure from Kempeitai-organized demonstrations and the threat of his own assassination, and by August 5 he had negotiated the Japanese demands down to the handing over of the four suspects and the acceptance of restictions on entering and exiting the concessions. The concessions remained sovereign British territory and Japan did not join the Axis against Britain in 1939. Given the weakness of Craigie's hand, it was a remarkable achievement.